Matters incidental to the execution of any power vested by this Constitution in the Parliament or in either House thereof, or in the Government of the Commonwealth, or in the Federal Judicature, or in any department or officer of the Commonwealth. 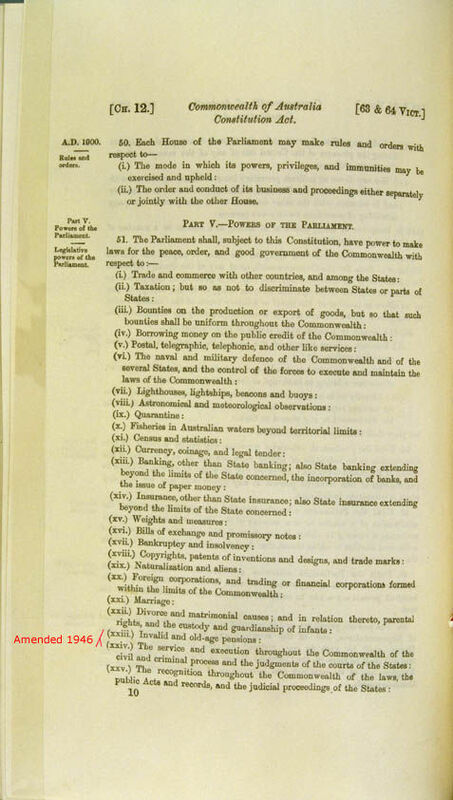 This addition of clause xxxiiiA to Section 51, introduced by the Chifley Labor Government, gave the Commonwealth Parliament the power to make laws for the provision of a much wider range of social services � child endowment, benefits to students, unemployment benefits, medical and dental services, maternity allowances, family allowances, sickness and hospital benefits, widows' pensions � as the Constitution had only referred to pensions for invalid and aged people. This more prominent role was reflected in the establishment of the Commonwealth Department of Social Security in 1939, the Department of Immigration in 1944, and the Commonwealth Employment Service and the Commonwealth Office of Education in 1945.